Easy Lemonade Margaritas have just 3 ingredients! This is the perfect summer cocktail and tastes great by the pool! Lemonade is such a refreshing summer drink. Making a margarita out of it is the perfect way to pump up the flavor of your lemonade for summer! Okay so I’m just going to go ahead and admit it: half the ice in that glass is fake. I know you were thinking it, so we just needed to address the (frozen) elephant in the room. I hate shooting drinks with ice. In fact, I hate shooting anything cold or frozen; you have to work fast. Plus ice creates condensation and melts and is just a pain in the you-know-what. So I went on over to Amazon and bought myself some fake ice for cocktail recipe shoots. So, that answers the question you were surely asking yourself: was that fake ice in the glass? Yes, yes it was. Also: if you ever buy fake ice make sure it says it floats. This is such a stupid easy recipe, with only three ingredients. It’s perfect for summer! 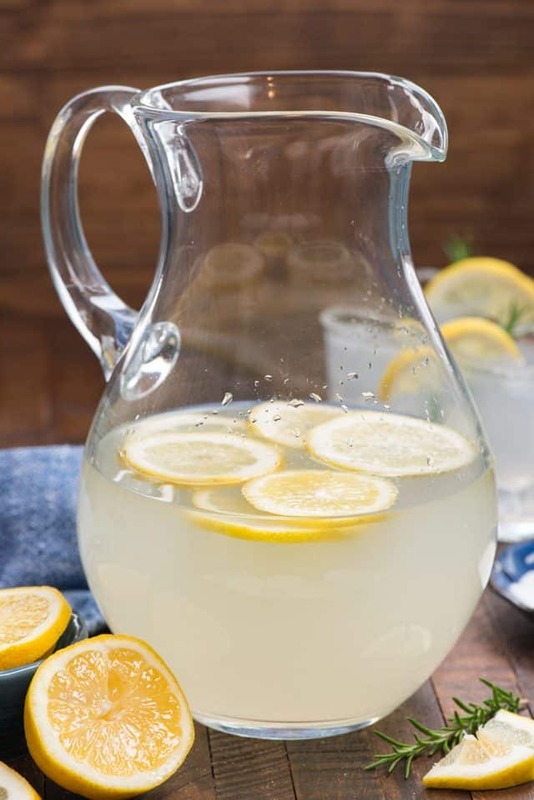 It’s already so hot here (and, according to Al Roker, it’s most likely going to be hot for you this weekend) so after a day watching my kid swim all I want is a super cold glass of lemonade…spiked, that is. 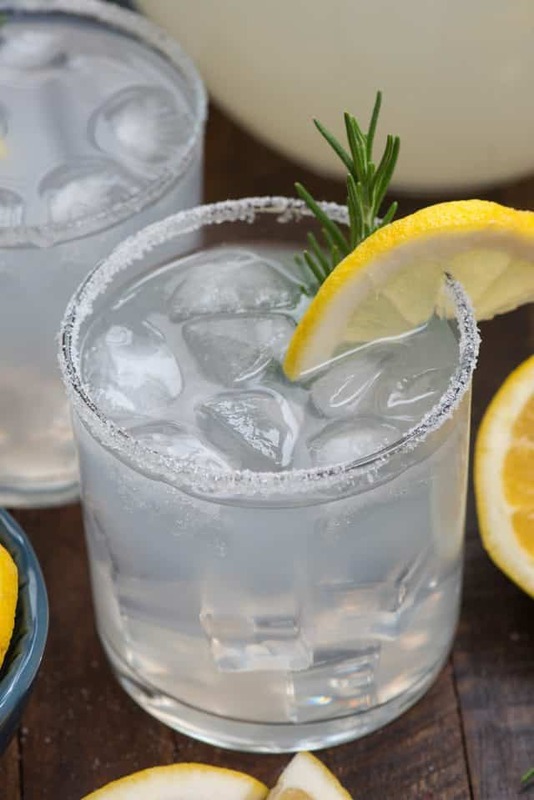 Lemonade Margaritas on the rocks, served cold, are the perfect summer drink. With only 3 ingredients, you can have this in hand in under a minute! That’s right: I said three ingredients. I know a lot of people wonder about making frozen lemonade margaritas, which you could totally do with this recipe, but I prefer margaritas on the rocks. I know a frozen margarita basically has the same ingredients as one over ice, but there’s something about drinking a frozen drink that makes me think I’m having dessert. If I drink it on the rocks, I can have two. Don’t you enjoy my logic? Plus, the aforementioned hatred of shooting anything frozen…so on the rocks it is. Now, of course, you can make lemonade from scratch. (Do people do that? I never have.) My from scratch lemonade comes from Minute Maid or Simply Lemonade or, in a pinch, Country Time. When I’m dieting, my homemade lemonade comes from Crystal Light. The beauty of this easy 3-ingredient margarita recipe is that you can use what you like. 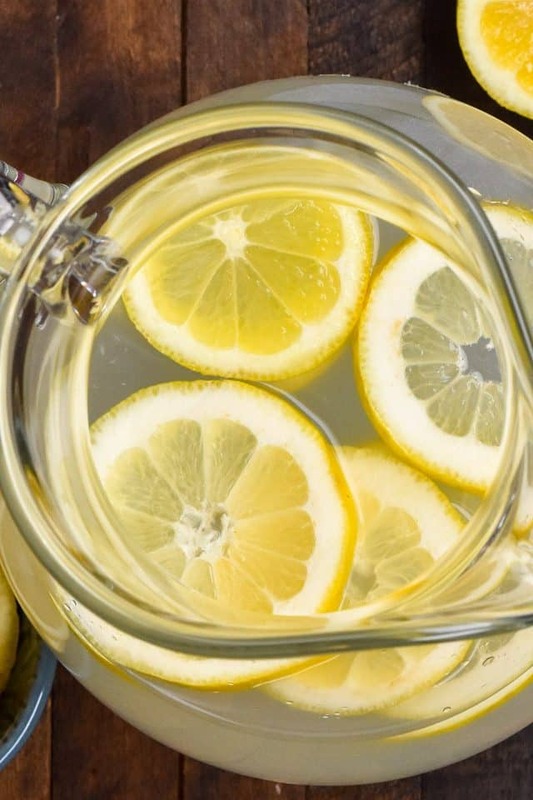 Use your favorite lemonade! Homemade, jarred, bottled, powdered: use your favorite. You could totally make this simply lemonade and tequila, but for a more authentic margarita, you need to add triple sec. A traditional margarita is just lime juice with tequila and Cointreau, so this isn’t that far off. Triple Sec and Cointreau are the same thing, but Cointreau is the brand name, I believe. So basically, Cointreau is top shelf and triple sec is just the category it falls into. For a great tasting margarita, Cointreau is the way to go…but I usually buy the cheap triple sec. As for tequila, use a clear version. Again, top shelf brands will make your margarita more refined, but you can use your favorite. Use what you like! My rule of thumb for liquor is this: for shots, buy the good stuff. For mixing, buy the medium priced. Just skip the lower shelves of the liquor store – that stuff won’t be very good at all. 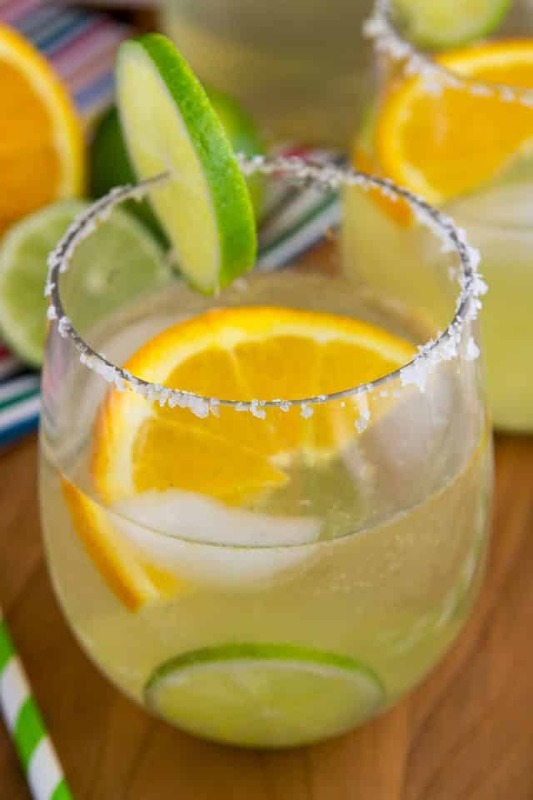 Easy Lemonade Margaritas are the perfect summer drink. Nice and cold with only 3 ingredients, this cocktail is perfect at a party, by the pool, or just as a 5pm pick me up! Use a lemonade you love. Use a medium to good brand of tequila. Triple Sec is orange liqueur; just buy one you like. The recipe calls for a range of lemonade. Prefer a stronger cocktail? Add less lemonade…etc. Serve chilled, in a glass rimmed with sugar or salt, garnished with a lemon and some mint or rosemary for color. To make one drink: rub glass with lemon slice, then dip glass in sugar or salt. Mix tequila, triple sec, and lemonade in a glass with ice. Add more lemonade if the drink is too strong as written. Garnish with lemon. To make a pitcher: mix all ingredients in a large pitcher. Add more or less lemonade to make this stronger or weaker. Add lemon slices for garnish. To serve, rim glasses with sugar or salt (run a lemon slice around the glass then dip in salt or sugar). Serve over ice. Be sure to check out my list of fabulous margarita recipes! Plus, I can’t wait to try Lisa’s Tropical Sangria Margarita, Aubrey’s Margarita Mules, and Erin’s Skinny Margarita! 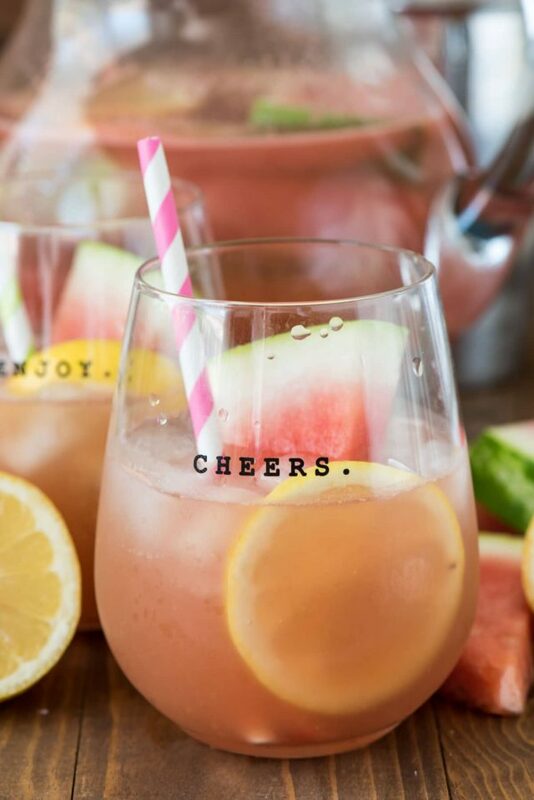 Margarita Sangria combines wine and margaritas for a perfect party punch! 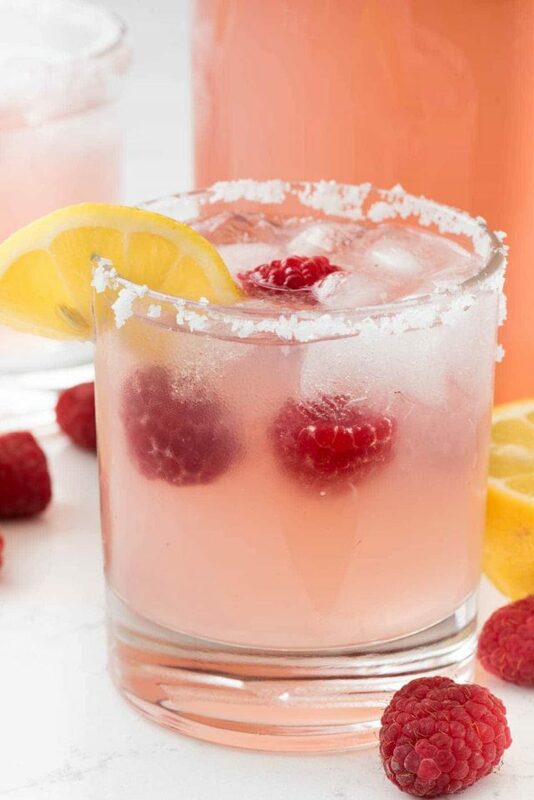 Raspberry Lemonade Margaritas adds some raspberry flavor to lemonade! Watermelon Margaritas are one of our favorite summer drinks! I honestly never would have noticed it was fake ice! I hate shooting anything with real ice as well. So challenging. These look so refreshing! Lovely idea to make this margarita. Really loved it. Can’t wait to try it for my family.